First, I will introduce myself and then I would like to tell you about a dear friend and colleague, who was recently killed in Syria, Dr. Hassan Mohammed al-Araj of Hama. I have been in the humanitarian field since 2010 and have worked in Africa and the Middle East, including assignments in Jordan and Iraq. Most recently I worked in Gaziantep, Turkey as Program Manager, responsible for the cross border program inside Syria. I spent 16 months in Gaziantep and it was during this time that I had the great honor to meet Dr. Hassan and work closely with him supporting health facilities in Hama province and elsewhere. I am writing to you today as Dr. Hassan was killed two weeks ago in Hama province by a Russian airstrike as he traveled between two hospitals, the “cave” and Kafr Zeta. The cave hospital has literally been carved into a mountain in an attempt to protect it from Assad regime and Russian airstrikes. I am not sure whether you have written about the relentless airstrikes destroying health facilities in Syria, killing medical staff and civilians but it is an on-going tragedy and disaster with no apparent end in sight. Dr. Hassan was the last cardiologist in Hama province. In addition to performing lifesaving surgeries, speaking out against the targeting and destruction of hospitals in Syria, he was also the head of the Hama Health Directorate and worked closely with Syrian American Medical Association (SAMS). Dr. Hassan was greatly admired and respected, his tragic death has left a huge gap in Syria. Since Dr. Hasan was killed, the airstrikes have continued relentlessly, attacking health facilities, civil defense centers, bakeries and other civilian areas. Just a few days ago, a hospital in Aleppo, Al Quds, was destroyed in either a Syrian regime or Russian airstrike. 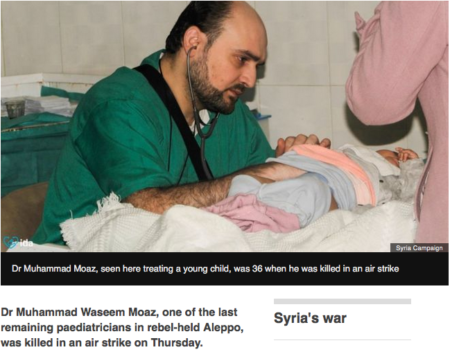 In addition to killing children, they killed the last Pediatrician, Dr Wassim, in opposition held Aleppo. This hospital was supported by several humanitarian organizations and was part of the program that I was responsible for until I left Gaziantep in November 2015. Dr. Wassim now joins Dr. Hassan on the long list of courageous medical workers and other innocent civilians, killed in airstrikes in Syria. My Syrian colleagues and friends are feeling a growing sense of despair and desperation as more and more health facilities are destroyed and little is being done to stop these senseless and brutal attacks on civilians. Please let me know if you would be interested in helping keep the memory of Dr. Hassan alive and so many other brave heroes by telling their story. Every time I talk to friends and family about the ongoing attacks on health facilities and medical staff, they ask me why so few people are telling this story. I don’t know the answer. Thank you for giving me the opportunity to tell you about the brave people that I have had the great honor to work with. “A good man is gone” was written by my brother Chris and posted. Here is a link from the US Embassy in Damascus. I have also attached two pictures of Dr. Hassan. 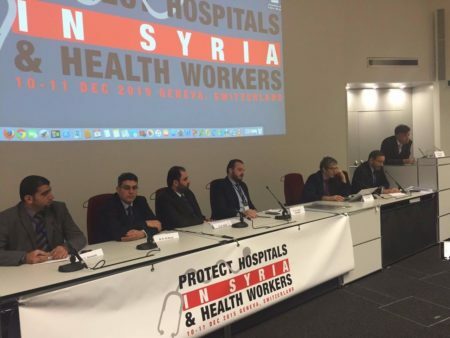 One of the pictures is from December 2015, when Dr. Hassan attended a meeting in Geneva calling for the protection of hospitals and medical workers in Syria. 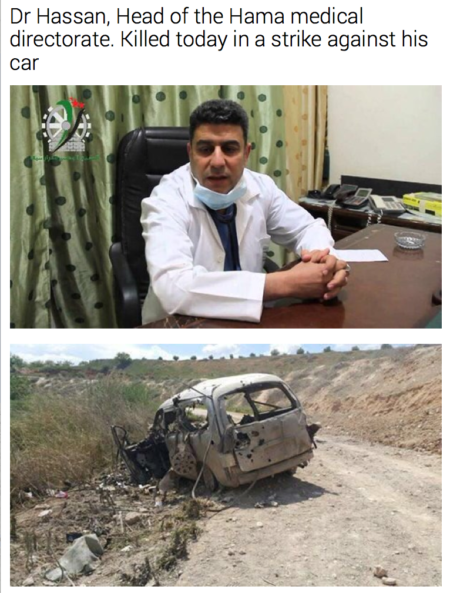 The last two pictures are from the airstrike that killed Dr. Hassan as he drove to Kafr Zeta hospital from the cave hospital. A member of my team spoke to him by telephone ten minutes before he was killed. Cynthia Coffman has worked in the humanitarian field since 2010 starting with the earthquake in Haiti. She has worked in Africa, the Middle East and most recently in Gaziantep, Turkey, where she was responsible for a health program supporting medical facilities inside Syria. 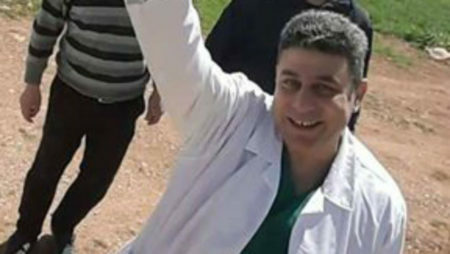 Dr. Hassan’s death adds to the 730 medical personnel killed in Syria that have been documented by Physicians for Human Rights since March 2011. Between the beginning of hostilities and December of 2015, some 246 facilities have been damaged or destroyed in the Syrian conflict. Estimates for the first quarter of 2016 are of 13 additional attacks on health facilities. In 11 of the world’s war zones, between 2011 and 2014, the International Committee of the Red Cross tallied nearly 2,400 acts of violence against those who were trying to provide health care. That works out to two attacks a day. The effort by the international community to stop attacks on Health workers is the subject of Somini Sengupta’s article, “U.N. Security Council Condemns Attacks on Health Workers in War Zones,” in todays’ New York Times. She explains that “in Yemen, the poorest country in the Middle East, a fourth of all health care facilities were destroyed or shuttered in one year of war, according to the United Nations.” Unfortunately, “the new UN resolution drafted by Egypt, Japan, New Zealand, Spain and Uruguay, avoids a direct reference to possible prosecutions by the International Criminal Court, a delicate topic for some countries.” To understand the politics that make UN efforts to condemn the targeting of health officials in places like Syria difficult, also read Colum Lynch, “Inside Saudi Arabia’s Push to Silence Criticism of Its Brutal War in Yemen.” Also see Colum Lynch and John Hudson, “MSF Blasts U.S., Russia, Syria, and Saudi for Hospital Strikes:” After another attack on one of its hospitals, Medecins Sans Frontieres takes to the United Nations to settle scores. Where are those nice BDSers on this issue? Will they boycott Syria too? By failing to lay charges against those responsible for bombing the hospital in Afghanistan last year, Obummer’s America missed the chance to model a precedent and show legal and moral leadership. The findings refused to blame those involved because it was deemed “unintentional”. This, along with other details in the report, showed individuals employed, trained and deployed for high-stakes lethal exercises casually flaunting critical rules and procedures. In a theatre of war = war crimes. Americans should also be calling for blood at the betrayal and disgracing of their country by this behaviour. In real life they would be facing prosecution and jail for safety violations if even a pet cat had been killed. This is a clear, highly professional report based on open sources which proves Russia’s deliberate bombing of civilian targets and lies about targeting ISIS. I am playing catch-up here, having just gone through the two discussion threads before this one. I appreciate the comments by HOPEFUL, OBSERVER, MAJEDKHALDOUN (and yes, AKBAR PALACE) and others about the hope for democracy in the region and how deep rooted and inevitable Assad’s behaviour is. For those prepared to wrestle with these issues in a deeper vein – and I warn, come out less optimistic, I recommend work by the excellent scholar Yezid Sayigh on reforming the Arab security state. His focus is the deep, virulent cancer of the security apparatus infecting Arab states under regimes like the Assads. His work shows how nothing can change unless this is fully eradicated and the roots disinfected. Unfortunately, as he points out, this will require massive disruption and risks bound to threaten political, institutional and economic reforms. For a deep dive, read his latest paper http://carnegie-mec.org/2016/03/30/dilemmas-of-reform-policing-in-arab-transitions/iw6o, or you can find him on youtube podcasts or in articles like this one: https://www.project-syndicate.org/commentary/reforming-the-arab-security-state-by-yezid-sayigh-2016-03. But for anyone wanting to think realistically and seriously about what has happened to Syria and its potential future, Yezid Sayigh’s detailed work is required reading. I am laughing at the trolls who gave the instant thumbs down to my separate criticisms of both the Americans and Russians for their civilian bombings. Very even handed. Thumbs up for ALL and ANY war crime air strikes against civilian targets. I hope they give us a post elaborating on their their view. Assad regime has had long standing history of targeting and assassinating doctors, ambulances, and health care facilities. Hizbollah recently killed the last remaining surgeon in Zabadani. Syrian doctors have been very vocal against Assad regime and have testified several times in the congress and during security council sessions. Those testified were Syrian doctors practicing in Syria who were able to come to the USA briefly for that matter and returned to Syria to continue helping people. Bashar is afraid of Syrian doctors, rightly so as inshallah they will testify against him when being tried for his war crimes . All sides have been guilty of targeting doctors and medical facilities, one party guilty for the most of it. Either way it is a war crime. The loss of these brave medical professionals is yet another chapter in the tragedy unfolding in Syria. At this point as a Syrian, I have nothing but utter contempt for both the Assad regime and the opposition. Increasingly they mirror each other and they’re bargaining with Syrian lives while pretending at diplomacy at Geneva. Someone should calculate how many innocent lives have died while these supposed representatives of our people refuse to even sit in the same room together. If Russia and the US chose to end this conflict it would be over before you know it. But as long as the faucet is on and weapons keep pouring in we’re left with more polarization and extremists on both sides. The US took down the Saddam regime 3 weeks. It wouldn’t be any different to do the same for Syria. The difference is that the Obama administration abhors American military might. The US received no Arab support for taking out Saddam. Should the US commit blood and treasure to takeout Assad? I hope someone here can make a case one way or another. Please read the study by Yezid Sayigh and you will see it is not about “taking out Assad/Saddam”. Much more importantly, it sounds a warning about the major holes, aftershocks and implosions that happen when you dismantle the security/military infrastructure in dictatorships. They form a far bigger part of employment, economic activity and social systems than many realise until it’s too late. Iraq is the poster example and template for what happens when you ignore this. I am one of the few Arabs I know who supported Bush’s invasion of Iraq. I am one of the few Arabs who still believe, to this day, that getting rid of Saddam was a good thing, and that Bush’s intentions in Iraq were not conspiratorial, like many people believe. I cheered for Libya when Qaddafi fell. I hate the Assad regime. But, like Obama, I reached the conclusion that the US’s military might does not solve the problems. The US, as a country, is unable to produce today the kind of commitment needed to deal with the aftermath. For many reasons: political, economical, social, etc. the US cannot put together and carry on a plan like the Marshall plan to help a country make the transition needed. Because of that, the aftermath of invasions, is misery and failed states. I wish if it were different, but it is what it is. I know how much you dislike Obama, but on this point – and I speak as an Arab desperate to see positive changes in the Arab world, and as an American who strongly believes it is in America’s self interest to see democracy and free markets all around the globe – Obama is right. For many reasons: political, economical, social, etc. the US cannot put together and carry on a plan like the Marshall plan to help a country make the transition needed. Because of that, the aftermath of invasions, is misery and failed states. The aftermath was that the US needed a permanent presence in Iraq just like our presence in Japan, Italy and Germany today. The US should not have left Iraq. It was going fairly well after the surge. Obama had to scuttle everything we accomplished there to “prove” GWB was wrong. That’s what really killed everything. And voila, ISIS was born. I know a very astute Israeli observer on another blog who agrees with you. He feels Obama’s hand-off approach was the right course. I disagree. A permanent base in Iraq is a buffer against Iran and ISIS. Iraq needed a lot of time to reform. Now we have ISIS, Iran and Russia calling the shots to their benefit. FYI, an old acquaintance of mine, Dave Wurmser was one of the “neocon” proponents of the war against Saddam. Before the invasion, he wrote a book, “Tyranny’s Ally”. At the time (late 90’s) I got to meet Ahmad Chalabi in DC. I guess, in retrospect, trusting that man was a mistake, but he wasn’t the key to our success in any case. As you know, this foreign policy recognizes that the Middle East is filled with despots and towel-heads and in dire need of freedom and democracy, that when arabs are able to control their own affairs, they will do just fine. Israel would only benefit from a free Middle East. Yes Obama came to power with a mandate from the country to bring the troops home and he delivered. He made a campaign promise and he fulfilled his promise. He was convinced that was the right thing to do, and the nation agreed with him. This is how democracy works. You believe his motivation was just to be anti-Bush. If that were the case, he would not have kept the same defense secretary and would not have pointed a state secretary who voted for the Iraq war. Obama is pragmatic not ideological in my opinion. True. Therefore a US Administration has either 4 or 8 years to get the job done, whether it is an economic, healthcare, or a foreign policy initiative. Unfortunately, therefore, an initiative to “change” the ME will take a huge calamity like a world war, for something to be done effectively. 9-11, simply, was not enough to shake the system. We will lumber along with isolated disasters until the world decides enough is enough. I believe Obama IS an ideologue, one who believes we should take care of our people “cradle-to-grave” no matter the circumstances and one who believes the US doesn’t stand for anything good in the world. Now that Obama is in office, Michelle is proud to be an American. Let’s agree to disagree on this one. I respect your opinion and actually agree with you on a bunch of other issues. I thought Bush was a terrible president but he was my president for 8 years – the people have spoken. I feel you are a little non-judgemental and gentle about Obama. His last term has been striking for the open disillusionment and frustration from members of his own party and administration. Read around and see. – He loves speeches and theorising but hates decisions, and lost his appetite for the job very early on. – “It takes an Obama to get a Trump”. Bingo! I Couldn’t have said it better myself. Thank you for the civil response. I appreciate you and your opinions as well. Obama also says one thing about Israel but his record shows something very different. Ironically, President George H. Bush (Bush senior) made US aid to Israel conditional on curbing Jewish settlements. Under Obama, both the aid and settlements have expanded. Kind of like the “red line” he set with Assad over chemical weapons – shiny airborne words made of fast-dissolving material. I hate to accept it, but it’s now apparent that “misery and failed states” are the inevitable destiny of Arab states built under dictatorship whether the US intervenes or not. A pre-determined aftermath nobody knows how to avoid, with the next phase of recovery and coming out the other side still to happen. But I 100% agree with you there was a good case for Saddam and Gaddafi to have their removal accelerated. AND Assad. And for those who claim that with without intervention Iraq and Libya would have gone on to be OK, there were even more scary scenarios waiting of dystopian nightmares and civil turmoil when Saddam Hussein’s and Gaddafi’s sons succeeded them. Remember them, everybody? With Iraq, as we know stupid, disastrous mistakes were made by certain parts of the American administration, most famously the decision to unilaterally dissolve the military and Baath establishment. (Actions vigorously advised against by some key State Dept and Pentagon officials – I remember the debate at the time, and the subsequent flow of later revelations and analysis by inside players). But yes, I largely endorse what you say. I hope you scrub your hands clean every time you remember meeting Ahmed Chalabi. His death last year saw him remembered as a con man and manipulator who was later suspected of being an agent for Iran, and who spent his remaining years making trouble as an ambitious self-serving meddler and fringe player in Iraqi politics. Yes. Chalabi pulled the wool over the eyes of the GWB administration and the neo-cons who thought he was a partner. No humanitarian should have cried when his regime crumbled. In the Middle East, no good deed goes unpunished. I have no problem scrubbing my hands and asking for forgiveness, but toppling Saddam, for me, was something America should be proud of. Oh, and BTW, WMD WERE found in Iraq. Do not link Israel laws to Tara, link it to IDF Maj Gen Yair Golan. It appears that he has different opinion in regard how the “law” of Israel get applied to the Palestinians. And by the way Tara listened to you and soul-searched all day yesterday but found nothing. Zero ! Zilch! she is now inviting you to soul-search. PLEASE be careful though, you may reach a conclusion similar to Yair But if so, stop right there . DO NOT over DO IT. I do not want you to conclude that Jews should have united behind Hitler butchering them as you are now advising the Syrians to do. Claims that modern day Israel resembles Nazi-era Germany can often be dismissed as anti-Semitic ravings, but now parallels between the two have been made by an unlikely source – a serving senior Israel Defence Forces (IDF) commander. Furthermore, Major General Yair Golan made the comparisons whilst addressing a Holocaust Memorial Day address in front of Israeli politicians. In his address, Golan said those remembering the Holocaust in which six million Jews were exterminated should also draw lessons from that great horror and ensure it is never repeated. However, he said, he could see some parallels between then and now, except, he appeared to imply, this time Israelis could be seen as the oppressors. This is embarrassing. You didn’t READ what I said above. I strongly endorsed the removal of Saddam Hussein! And I NEVER mention WMD, as in my mind the issue was a tacked-on political side circus. Just as it was never the point also with quite a few commentators, analysts and politicians supporting action against Saddam in the lead up to 2003. I remember there was already existing consensus by a number of western policymakers that Iraqis and the wider world needed to be rid of Saddam Hussein – thinking largely linked to the “unfinished business” and aftermath of the first US/Iraq Gulf War of 10 years before. This had left the majority Shia and Kurdish populations of Iraq abandoned and exposed to unchecked massive reprisals by Saddam. When the global alliance chased Saddam out of Kuwait, there were widespread Shia uprisings in Iraq built on the expectation that the alliance was going to continue on and support Iraqis in getting rid of Saddam. And I remember that the US very nearly did, but pulled back after giving mixed messages and falsely raising the hopes of many Iraqis. The outcome was nonstop campaigns of terror and genocidal reprisals unleashed by Saddam against the people of Iraq – the result of which included mass graves of up to 10,000 people and spectacular surges of mass flight by the Kurds. UN sanctions against Saddam then stretched out the misery (which included incidentally sanctions against chemical WMD used by Saddam against the Iranians and Kurds), and saw Saddam’s paranoid, industrial-scale cruelty against ordinary Iraqis spread and intensify. So don’t bark at me. I happen to be on your side of the fence on this. Chalabi was a trickster and opportunist desperate to grab power in Iraq by any means. He already had a record of failures, disasters and corruption when he infiltrated key US circles via certain Americans, who should have been later punished for aiding and abetting him. Thanks for the clarification, and yes I remember, despite my advanced years. Chalabi was the head of the Iraqi National Congress, which, at the time was supposed to be a liberal, pro-democracy resistance to Saddam near as I recall. We are definitely on the same page, and thank you for your patience. In Arab countries, officials get fired if they simply mention Israel in any positive light. I agree with you about Obummer. But if you read my “I remember” comments in #22 about the seeds of US intervention in Iraq perhaps you can see why for some of us it’s not easy to have clear “shoulds” and “shouldn’ts” about the way history unfolded. Criticizing US involvement in Iraq is in some ways inconsistent with criticizing Obama for his weakness and failure on Syria. America’s inaction on Syria can be shown to have flung open the door to the spread of ISIS and the brutal unchecked invasion and attacks on Syrians by Iran and Russia. But with Iraq, back then Iraq’s vicious minority dictator filling mass graves of 10,000 Shia and using chemical weapons to massacre Kurdish citizens wasn’t happening just because the victims failed to fight back harder. (Iraqi people DID revolt post-Kuwait, and they did it with the mistaken hope the US would back them.) Just think Syria. And I have yet to hear anyone successfully argue that the future would have turned out any better and different in Iraq and Libya even if there had been no outside intervention. Saddam and Gaddafi’s sons would be doing the same as Assad Jr. It seems to be in the DNA of these hereditary dictatorships to implode into civil war and failed states by one route or another. “Freedom,democracy and justice” we are now beginning to understand isn’t going to happen in dictator-built Arab states without terrible cost, suffering and turmoil. The snake has too many heads, the body too deeply poisoned and dysfunctional to be quickly re-engineered and transformed. The role of the west that matters is going to be in aid and reconstruction – there is nobody else. I think this is the difficult question. Obviously, the arabs need help. Years of being abused, the average arab cannot fight for himself. Weapons are only in the hands of the dictators, despots, and religious fanatics. I strongly support Maj. Gen. Yair Golan’s truthful comment. He is a brave honest man who isn’t afraid to say things that are perceived as political and unpopular. Indeed, there are trends within Israel’s society that we should fight. New phenomenons such as the crime in Duma, the crime of the burning the kid Abu Khdeir (the criminal got life in prison + 20 years), burning homes in Arab villages in the WB etc. Also we should suppress the voices (few but vocal and vulgar) in the extreme religious right-wing. They want a Jewish anti-democratic sharia state. This was my soul-searching. What is yours? I told you I soul searched all day yesterday and found nothing . If what you want to hear from me is that Sunni Muslims need to fight the Muslim terrorists and the mentality that brought them to life . And that the Sunni establishment should make it quite clear that jihadis are condemned and their mentality is not islamic . You have heard it on countless occasions from me but you have an endless desire to hear it in every post or every other sentence for unclear reasons other than what is proved by science that people believe in what they want to believe despite evidence to the contrary . I truly believe that arrogant and bigots tend to fall more into this. Why do you Amir always ask me to soul search? Additionally, if you think that Sunnis are not fighting the terrorist mentality adequately, it is because we are people لا حول لهم ولا قوة. Meaning we are individuals who do not count and in the eye’s of our government we are farm animals or slaves. our voice can’t be effectively heard except if we live in democracy that enable us to make our voices heard. Now you will never hear from me that Syrians should unite behind their butcher to fight Isis. Isis can only be defeated by Sunnis only after the fall of Assad.